Just the title evokes visions of hot steamy nights with the exotic (and for me exciting) aroma of damp vegetation and soil. The atmosphere that assures one of tempting and flavourful food. Michal Haines has had a warm relationship with spices for all of her life. Her Chinese grandfather, Stan (you know that any Chinese grandfather called Stan would be a positive influence) left her with memories of fine food and a treasured meat cleaver. Michal has worked extensively in the New Zealand food industry, running gourmet food stores around Auckland. 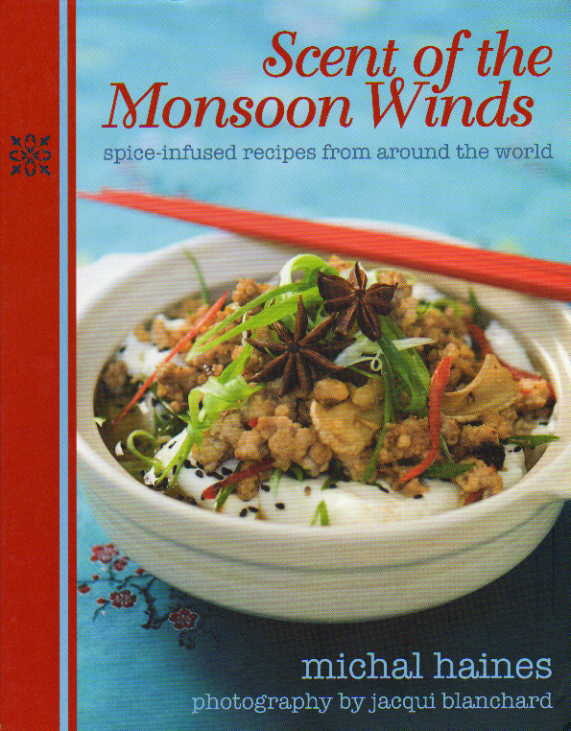 Scent of the Monsoon Winds is a multi-ethnic cookbook with great shelf appeal. Michal offers an introduction to spices and their uses in the five main spice-dependant cuisines, and she suggests a list of spices that will allow you to prepare those dishes. There is nothing much that will demand a vacation to the Spice Islands (although it’s a good excuse). You’ll find it all in your regular supermarket, or mail order if you live on a remote hilltop. The chapter headings are intriguing: Portable Feasts, Spiced Nights, Winter Blues and Kingly Condiments. The recipes are also a unique bunch, encompassing some celebrated dishes such as Indonesian Chicken Rampah and Cheese Sticks, but there is a lot here that will be new to many readers. Even an impressive book collection would not provide you with Michal’s own family recipes, which she shares here. Scent of the Monsoon Winds offers modern versions of some classic dishes such as Drunken Chicken. This is a tangy but light dish with a kick from ginger, Szechwan peppercorns, star anise and cassia. Arabian White Coffee Cream will transport you to the souk: this is a sophisticated but simple dessert and truly a bit different. Hot Mezze Hummus is a speciality of the mountains of Eastern Turkey and is a radical departure from the ubiquitous tepid hummus that we recognise from deli counters and Middle Eastern restaurants. This recipe has additional flavours and textures and is altogether more complex, although very simple to prepare. If you are looking for a quick meal with impact then you could be turning to Vietnamese Dinner Noodles. There are quite a few ingredients but don’t be put off – this is cooking at its basic best. Pirate Chicken has plenty of punchy panache with Jerk Paste supplying the heat. It’s another fast meal but impressive nevertheless. If Scent of the Monsoon Winds has a signature dish then it is, for me at least, Honey Tamarind Roast Duck. This is a flavourful and succulent recipe which avoids the perennial problem of dry meat. It all has to do with the cooking method, and this roast duck isn’t roasted but rather simmered. This is going to be a new classic. Scent of the Monsoon Winds is an attractive volume of charm and innovation. It will be enjoyed by spice lovers who don’t have endless time to spend in the kitchen. We will, I hope, hear more from Michal Haines.